It is important to use the right tools for a given job. Science is no exception. In particular, given the vast amounts of data that are now routinely encountered in the field, one will want to use the best available data analysis tools (by whatever metric one prefers – ease of use, speed, efficiency, versatility, etc.). In neuroscience, there is a prevailing sense that MATLAB currently dominates the market for analysis tools, but that Python has a lot of momentum. 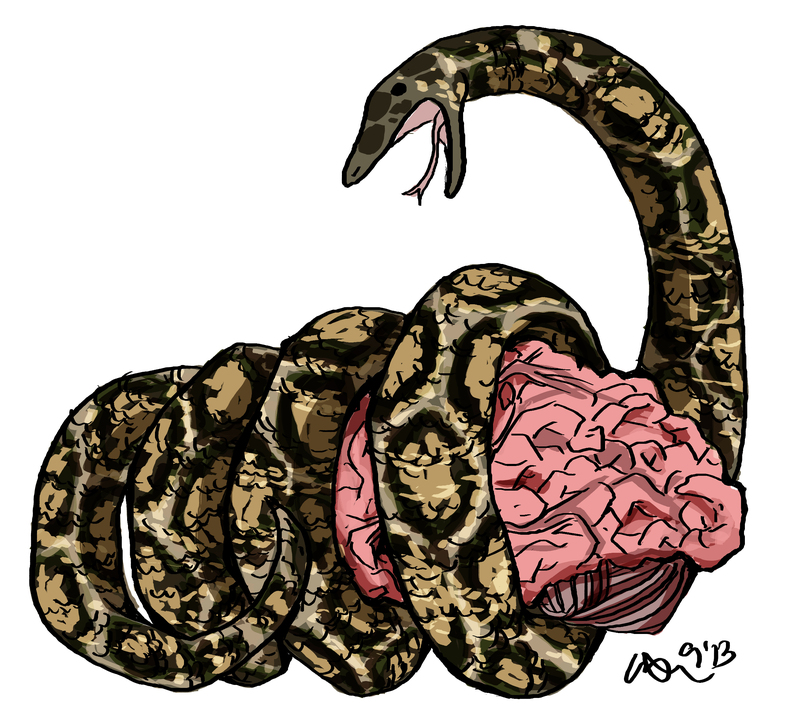 Is Python in the future of brain research? The results are below and they strike me as surprising, to say the least. A whopping 8 (in words, eight) hits for Python, 5 for Octave and none for Julia. Results of the Google search (as of 09/26/2013). The slice representing Python, Octave and Julia together is too small to be visible. Aptly, the data underlying this figure were analyzed using Matlab. So what is going on? Are scientists – despite all the enthusiasm for Python, Octave and Julia – not actually using these methods in published papers? Is there a systematically nuanced way of grammar usage that I am missing? 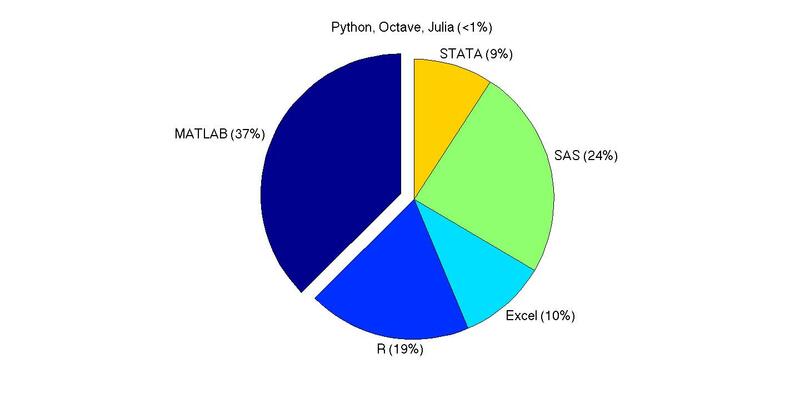 Regardless of the validity of these particular results, there can be no question that MATLAB cornered the analysis market these days (at least in neuroscience – I presume the heavy use of SAS and Stata takes place in other fields). Ironically, this is cause for concern. Success leads to dominance. Dominance leads to a sense of arrogant complacency that is not warranted in the field of technology. Just ask Nokia or the ironically named “Research in Motion,” ill-fated maker of the BlackBerry. Once a competitor has gained momentum because the monopolist missed “niche” developments, it is almost impossible to halt it. Finally, I hope we can move beyond primitive tribalism on this. I do understand that it comes naturally to people and that it is ubiquitous – be it with regards to computers (Mac vs. PC), cell phones (Android vs. iPhone), sports, etc. ; however, this kind of brutish behavior has no place in science. All that matters is that one uses a suitable tool for the job at hand so that one can do the science in question and hopefully move the species forward a bit. Moreover, it is understandable that any self-respecting programmer can’t have things to be too easy or straightforward. Otherwise, anyone could do them. That might indeed be the chief problem of Matlab. Seriously – it doesn’t matter as much which language you use to program as long as you are in fact programming. There is a simple reason for that: The success of western civilization allows for a second – heavily incentivized – route to rewards, namely social engineering (by hacking some fairly primitive tribalist circuitry). So the waves of BS can rise ever higher. But programming has to work. So the BS can only go so far. And we need more of that. More reality checks (in the literal sense), not more BS. We have too much of that as it is. The original blog post can be found on Pascal’s Pensées. Dr. Wallisch is co-author of MATLAB for Neuroscientists, 2nd Edition. The book serves as the only complete study manual and teaching resource for MATLAB, the globally accepted standard for scientific computing, in the neurosciences and psychology. This unique introduction can be used to learn the entire empirical and experimental process (including stimulus generation, experimental control, data collection, data analysis, modeling, and more), and the 2nd Edition continues to ensure that a wide variety of computational problems can be addressed in a single programming environment. Save 30% on this book when you use promotion code STC3014 at checkout!